The triple bunk bed was a commission build. Below you will find a link to the blog post I wrote and a link to download the SketchUp file I made. I was trying to get the plans for this bed so i can build in for my three young daughters but I can not seem to open it on my computer. Is is posisble to get it in a different format. Thank you! The plans seems to just have a picture…do you have a file that has complete info (specs, materials, etc.)? Leigh the the only format it is available in is SketchUp which is a 3D program. You can download a free copy of the program at http://www.sketchup.com/. Do you think this could be modified to add another bunk to make it a quad? The great thing about custom woodworking is that anything is possible! Hi, Your bunk beds look great and my husband would love to have a go at making them for our three sons. I have downloaded SketchUp and did a serach in 3D warehouse for triple bunk bed, there were 18 options but I couldn’t find yours. Could you help me to find your plans please? Thanks, Naomi. Naomi there is a link to download the SKetchUp file above on this page. Or click here. I took this on as a project yesterday! total cost was $170 and 6 hours of labor! I am very happy with the resut! Thank you so much for sharing this. Id love to show you a photo but I’m not sure how to post a photo. I’d love to see a picture of your build. If you go to the Merzke Custom Woodworking Facebook page you can post a picture there. Awesome job! My wife and I are very interested in this build, but in looking at SketchUp plans, the bunks have an overall length of 131″. Apologies for the seemingly novice question, but is that correct? I get the pic doesn’t show dimensions and is likely scaled down, but it doesn’t look almost 11′ long. I only ask because I’m working with a bit less space. Thanks! Roberto, yes I built this Triple Bunk Bed at that length to fill the space along one wall of the room where the clients were putting the bed. You could bring the beds closer along the length of it to build it where it will fit your space. Feel free to shoot me an email at mike@merzkecustomwoodworking.com if you have any additional questions. Lorna, I just emailed you back! Hi Mike, this looks fantastic! What size of mattress is it designed to fit? Tamara, Thanks for the kind words. This bed was designed to fit the twin sized mattress’s that the client had. 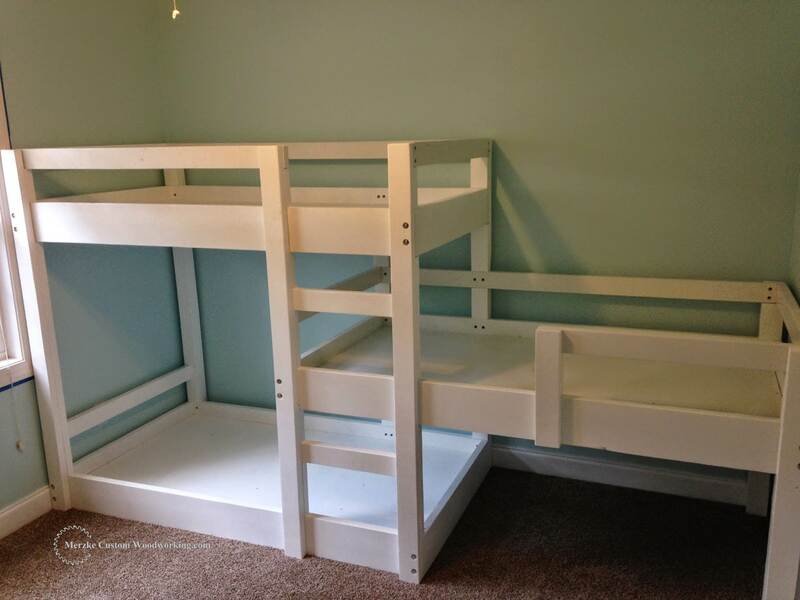 Heather, the triple bunk bed as I built it for the client was a total of 131″ long. You could easily modify it to fit your space. Hi I would love to get my husband to make one of these- can you still send us the sketch up file? We’ve got the program, thanks in advance!